Swiss Naturals Cranberry Extract 1132mg Caps 180's . Swiss Naturals Activated Charcoal 260mg 90 capsules. Swiss Naturals Digestive Enzymes 500mg 60 capsules. Swiss Naturals Blood Pressure Health Benolea 60 Caps . Swiss Naturals natural HRT Nightime 60 capsules. Swiss Naturals Solutions Stress 60 capsules. Swiss Naturals Saw Palmetto TR 1000mg Caplet 60 caps . Swiss Naturals Total One Multi Vitamin & Mineral Women 90 caplets. 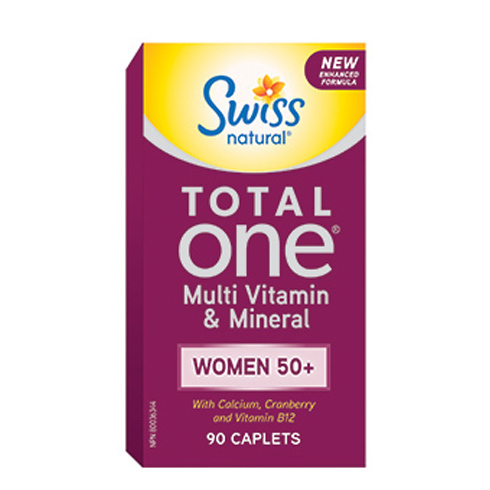 Swiss Natural Total One Multi Vitamin & Mineral Women 50+ 90 caplets. Swiss Naturals aHead Stress Support & Energy 60 cap .